Email marketing is a mainstay for today’s business. Online, offline, or out of line, you have to have an email marketing strategy, and you’ve got to continually refine that strategy to keep your conversion rate high. Email marketing has the highest ROI of every digital channel. But just because that’s true doesn’t mean your email marketing approach is locked down and guaranteed. It’s an important point: Email marketing success is never a guarantee for your business. You may have thought of a thousand ways to create an email marketing program, but that does not mean your program is going to work. Ideas are one thing, but the action behind those ideas is something else. The list that you see here is going to help you create an email marketing plan that takes ideas, puts them into action, and gets you results. Your life is busy enough as it is, and you do not need another half-baked program that will not give you any real results. Compare your current approach to this email marketing checklist and find out what you need to fix. You cannot do any email marketing if you do not know who your audience is. Your business has a specific clientele that you must cater to. Clients and customers who think you have missed the mark will get frustrated eventually, but you can avoid frustration with some common sense. It’s cliche to say know your audience. I get that. But I’m constantly surprised at the level of ignorance that some marketers and optimizers have regarding their audience. You should know their demographics. You should know their psychographics. You should possess a conversion optimization framework or heuristic. You should have a general understanding of human cognitive functionality and biases. The greater your knowledge of your customer, the better you will serve them with your email marketing. Let me apply this. If you don’t know your customers, you won’t segment your customers. If you don’t segment your customers, then you’ll send the same email to your entire mailing list. If, by contrast, you would make the effort to identify your audience, create a segment, and customize an email, then bam! You’d be instantly more successful. Look! More open rates, relevancy, lower opt-outs, greater revenue, etc. — basically all kinds of good things. Check out this one. It’s perfect. Every missing piece of knowledge, every little misstep makes it that much easier for your email audience to assume you do not understand them. And that will kill your email marketing conversions. 2. How Connected Is Your Audience? You may have your audience locked down tight, but there is nothing that says your audience will check their email, when they’ll check their email, or how they’ll check their email. Email marketing must go out to customers at the precise time when they choose to check their email. You do not need to do any sort of high-level espionage to get this information. You know which customers check email regularly, and you know which customers are not prone to check their email. Your business must have customers who check their email frequently. Customers who check their email in the morning should have emails from you waiting, and customers who check their email often should receive the emails mid-morning. People who check their email before lunch will get things done just before lunch to avoid dealing with the same items after lunch. Connected people will love your emails, and you may get several replies that help you stay in touch with your customers. If your customers are to be receptive to your emails, you must make your emails easy for them to find. You should be aware of the general data surrounding email checking times. For example, according to MailChimp, 2 to 5 p.m. is when most people are active on email. Day of the week matters, too. Looks like Wednesday and Thursday might be good days for an e-newsletter. But generic data is just that — generic. In order to really nail it with your delivery, you have to do your own research and come up with your own optimal times. This way you'll find the best opportunity for email marketing conversions. Your email marketing program is not going to be very effective if you are sending ugly email to your customers. Believe me. I’ve seen some ugly ones. There is no other way to look at such a problem. Ugly emails are like a dirty store or a foul-smelling restaurant. Everything you create for your email marketing plan should be beautiful, and you must cater to the tastes of your customers. These are simple design choices you can make for each email, and you must make the choices wisely if you want to attract customers who will continually read your emails. Pottery Barn’s consistent style makes their emails attractive and engaging. Customers who are accustomed to seeing beautiful emails in their inbox are more likely to read the emails. Customers should get emails in their language, in their style and at the right time. Do this and your email conversions will go through the roof. 4. Do You Have Correct Contact Information? I’m not sure who FNAME is, but it almost sounds like you’re cursing at me! Either way, you just violated a major rule: Make sure you have the correct contact information. Your email and contact information for every customer must be updated regularly. Your business must take a step back to update its directory before beginning an email marketing program. Every email you get back as undeliverable hurts your conversion optimization rate, and you lose money you are spending on the email program. The procedure you use to update your contact lists should be implemented for every sale. Ask your customers if they need to update their information, and ensure that the updates are put in the system as soon as you receive them. Your directory will be updated every few minutes if your program works properly, and undeliverable emails will be a rare occurrence. 5. What Content Should You Write? What you say in each email must be worth reading. Even the most loyal customer in the world is not interested in reading an email that is several thousand words long. Email programs show previews of each email in just a few lines, so the most important information in each email should be in the first few lines. Short emails often work best. Additional information you include in your emails may go below the fold, but you cannot ramble for too long. The most important thing to remember is that your email needs to possess a unique value proposition. Your business has a reason for existing — a value that only you provide. What is it? If your emails don’t touch on it, then they will cease to be relevant, actionable, and conversion-ready. 6. What Are You Offering? I love it when I get a good offer in my inbox. But there’s a difference between sheer spam and sheer value. Emails you send to your customers must have real information that is useful. You may want to speak at great length about the technical aspects of your business, but you cannot bore your customers when you send emails. Your customers are counting on your emails to provide real information or offers. There is no other good reason to send mass emails to your customer base. Information submitted to your customers via email should read like a blog post. Your articles should give lists, suggestions and information about your industry. Small tidbits of information are helpful to your clients, and the small items can be printed for their own wall. You are giving your customers something they can walk away from the computer and use. The articles you write must be as casual as possible. Your customers get enough formal letters in the mail every day, and they are likely sick of reading something that has a traditional opening and structure. Avoid traditional structure in your emails to help break up the monotony of someone's inbox. Get noticed and get more email conversions. Your content must read as a confident pitch for your business. No one ever sold anything by being meek, and your business does not hide in the shadows while it hopes for sales. Your customers bought from you when you made a strong pitch the first time, and they will purchase from you again if you remain confident. J.Crew wrote this confident email. Yes, that’s probably like an 80-point font, and they’re saying it like it is: Become a freaking fan already! Your articles should get straight to the point, and the articles should clearly explain why this email is different from previous emails. Customers will be drawn to you by your confidence. Customers will wonder why you even bothered to write an email that sounds timid or meek. Confidence in your emails is not arrogance. You are not assuming your customers will buy from you. You are providing an air of confidence that says your products and services are much more valuable than the competition’s. You are appealing to your customers on a need-based level. Your customers buy from you when they need things, and you must appeal to those needs. Never beat around the bush when you are talking to your customers. You want them to buy something from you, and you know your products or services are the best choice possible. Any customer that senses a hint of fear in your emails will turn to the competition for their needs. You put your company behind the eight ball when you speak from a position of weakness, costing you email conversions. Every customer loves a good sale, but you cannot offer a sale in every email you send. Sales that happen too often make customers wonder why your business must run the sale so much. Emails that never offer any value or bargain are going to be skipped over. You must have a balance of information and deals in your emails. The sales you offer should not be specific to one circumstance or action only. Customers who do not have time to come visit your store are not going to appreciate a deal being offered to walk-in customers only. Customers who come into your store all the time will not enjoy being forced to make a purchase online to get a discount, and you must not lock out your existing customers with sales that are only for new customers. The sales you offer in the emails must offer real value without simply giving money away to your customers. You may offer existing customers referral bonuses if they bring in new people, and you will gain new customers while catering to your existing customers. Your relationship with your customers involves a fair amount of give and take. Your customers read your information and keep up with your business, and they must receive a deal in return. Likability is important, even in something as teched-out, data-driven, and plugged in as conversion optimization and email marketing. Your email marketing program should have an element of friendliness in it that will help endear your business to the customers. Customers are expecting to see emails that sell something, but customers will be pleasantly surprised when they receive emails that are friendly. Virtual hugs? Where do I subscribe? Send emails to your customers on their birthday, major holidays and in commemoration of special events. Your customers will smile when they see these kind emails, and you will be one step closer to making your customers feel comfortable with you as their provider. And how would you like it if you're insanely happy customers actually tweeted about their love for your email? Friendly email writing must extend to the regular emails you are sending out. Speak to your customers in a friendly tone, and ensure that each email has a similar tone. Customers get tired of reading technical emails, and you must speak directly to them. An email that reads more like a conversation between two people is likely to have more of an impact than a form letter that you send over and over. Some emails you send might offer opportunities for your customers to partner with your business in new ventures. Your customers want to connect, give them an opportunity to join with your business in a new project, or ask your customers if they have opportunities they want to share with you. A unique selling proposition is helpful, but you may offer an open call to all customers for new ideas. Partnerships born from your emails can make your business a much better place to work, and the partnerships you start today could turn into the most lucrative opportunities you have ever had. Customers should never feel as though they are on the outside looking in. Your email marketing campaign is no good to you if implementing it becomes too costly. You could spend hundreds of hours putting together the emails, scheduling the emails and sending them out. 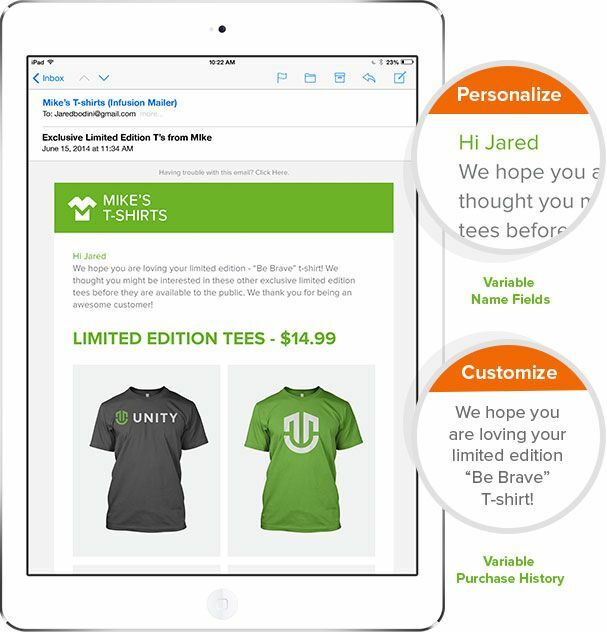 Email marketing software helps you plan your campaign in a single window on your computer. The software you use should be simple, and you must be able to edit information in the program at any time. Your distribution list alone could have several thousand names, and you must have direct access to that list. You can split up the list into smaller lists for specific people, and you may send emails on a schedule. You know when your customers are most likely to read their emails, and you can put the emails in their inboxes at just the right time. The email marketing campaign software also handles responses to each new email. You are not cluttering your email account with the emails that are going back and forth between your business and your customers. The emails come back to the program, and you may send replies from the business, not you personally. But every email you receive in the system makes it that much easier for you to stay in contact with customers. You are separating your work email from the account used to send out mass emails. Conversion optimization depends on a heckuvalotta stuff. And email marketing is just one of the big bag of things you have to optimize. You must take great care to compose emails that are purpose-driven, kind and thoughtful. Your customers can see when your only goal is to sell more products, and you must assure your customers that you are interested in them as people. The content you write for each email has to read well, and the emails must look beautiful. No one wants to see something ugly pop up in their inbox every few days. You must get to know the email habits of your customers, and you must use email software to send out new emails at your leisure. Your email marketing campaign cannot come from your personal email address, and you must work the campaign like it is a full-time job. The emails require a level of composition that is pristine, and your customers require emails that are fun to read. You may make friends with your customers through your marketing program, and you might discover new partners for your business. Never give up a marketing opportunity when you see one. Send emails to your customers that offer value, bargains and a friendly tone. This is a profitable combination in the hands of the right business owner or manager. So how’s your email marketing strategy? Do you have a strategy? How’s it working out for you?